Every time you play poker for real money, the poker room takes a small cut of every cash game pot or a small fee from every tournament you play. This is how poker rooms make their money. Rakeback is simply where you receive a percentage of this rake back to your account at the end of the month (or more frequently), instead of having the poker room keep 100% of this rake. If you play at a poker room with rakeback, you can generally expect to receive between 27% and 33% of the rake you pay back in to your account. How do I sign up for rakeback? Choose a poker room in the rakeback rooms section on this site. Sign up to the poker room through the links on this site. The only thing you have to make sure of is to sign up to the poker rooms through the links on this site. These links are special rakeback links that make sure you are able to receive rakeback in to your account after you have signed up. Where should I get rakeback? The Full Tilt rakeback deal is undoubtedly the most popular seeing as Full Tilt is one of the biggest online poker rooms. So if you haven't got an account there yet, Full Tilt would be my top recommendation for a rakeback poker room. After Full Tilt, Cake Poker rakeback is the next best option with its slightly higher 33% rakeback and good player volume. 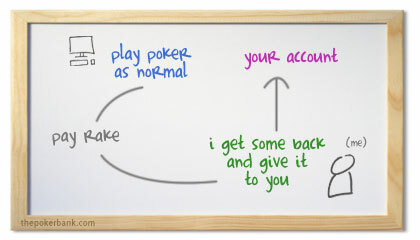 Aced Poker rakeback is also a very popular alternative amongst players, as its 30% rakeback is paid daily. Is rakeback cool with the poker rooms? Yes, the poker rooms that offer these rakeback deals are perfectly happy to pay a percentage of the rake back to the players who have signed up for a rakeback deal with them. Poker rooms do not automatically give all players rakeback because they will earn more money by not giving rakeback to players who are not aware of it. It's not at all dodgy or suspicious, it's just that rakeback is a very popular way of adding that extra bit of money to your bankroll in a way that is not openly advertised by the poker rooms. Are there any drawbacks to rakeback? There are absolutely no drawbacks to rakeback whatsoever. Seriously. Most players are wary of rakeback at first because it seems like extra money for no real reason, and they are probably a little disappointed that they haven't heard about rakeback deals before. It's just that as I mentioned, poker rooms are saving themselves money by not publicly offering rakeback to the players themselves. The vast majority of regular online poker players receive rakeback (including myself), and it proves to be very helpful to your bankroll. There really are no downsides at all... you just add that little extra to your bankroll with the money you save. Where can I find out more about rakeback? I imagine that you might still want to find out a little bit about rakeback at the moment before you go any further. That's all well and good, which is why I have compiled this big rakeback FAQ to help you answer those burning questions. I know that I had a lot of questions to ask when I first found out about rakeback. If you have any questions that you would like to ask me directly, please send them my way by contacting me at greg[at]thepokerbank[dot]com. Honestly, if you are unsure about anything and would like my advice on any matter to do with rakeback, just send me an email!